When Jennifer Worman showed up at an event wearing this dress & necklace combo, I asked her right away where both were from. I was elated to hear I could buy both on her website! This clearly needed to be my Valentine's Day date night outfit. I know my husband's taste, and he would love me in this! I decided to take photos wearing the pretty dress over the weekend so that anyone looking for last minute outfits could get this one in time. It is amazing and I can't wait to wear it for days/dates/nights out other then Valentine's Day! As an added bonus when we go out this week, he will not have to take photos of me for the blog. We can just have a lovely date night out and focus on each other. I realize Valentine's Day is a "Hallmark holiday" but if that means I get an extra date out with my love, then I'll take it! We should all be acting this way toward everyone in our lives everyday, it's a bummer Hallmark only thought to have it once a year in my opinion. Be kind and enjoy a night in or out with your bae, kids, or bff. Heck even a night in taking care of yourself would be a night well spent if you ask me. I'm thinking hot bath, candles, or a good book.... and a great dress of course! When Jennifer wore her dress, she too styled it with over the knee boots. To mix it up a bit, I decided to add some tights (which my daughter ran Velcro rollers across my left leg, better get a new pair by the weekend! 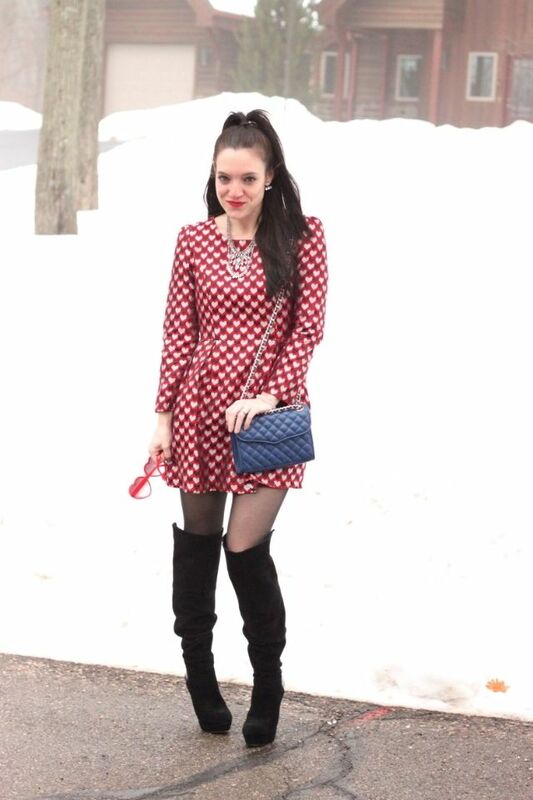 lol), a 60's inspired hair style, and my favorite blue quilted bag. 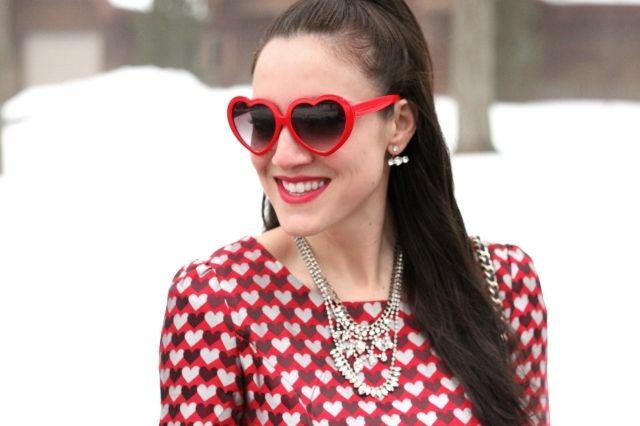 What are you wearing on Valentine's day? 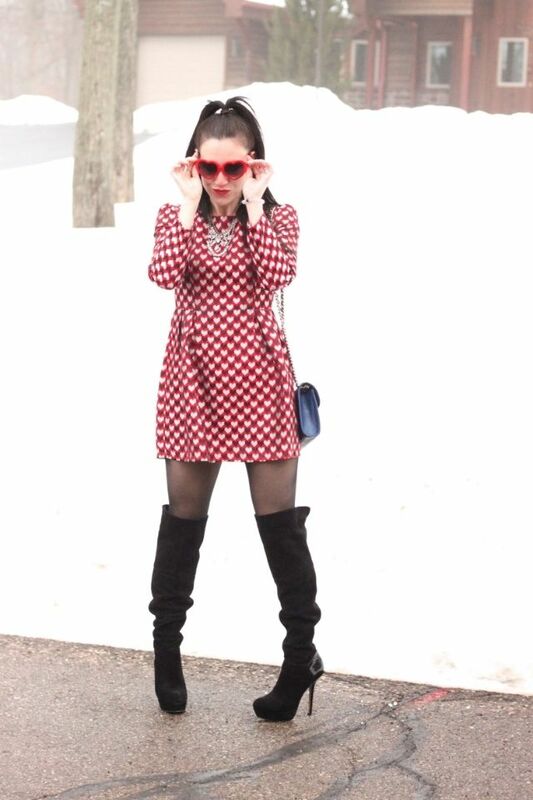 Do you ever get all dolled up in heart printed clothing around this time of year?